Did you know that Dewey's 24 Hour Read-a-Thon is my favorite book blogger event OF ALL TIME? Well, it is. I was a cheerleader and still managed to read a bunch of great books. But what that tells me is that I didn't carry out my cheering duties as well as I should have. I think I'm going to have to make a decision before the next read-a-thon comes around in April. I love cheering. I love reading. What's a gal to do? Annnnnyway, the point of this post is to give a bitty review of each of the books I read on Saturday. So, let's do that shall we? As usual, I make sure to pick out a stack of highly recommended SHORT reads. I like being able to read a lot of books that day and I don't think plowing through one large book would work for me. I'm a person who attaches a lot of meaning to objects so this book really spoke to me. I couldn't help but think about the objects in my life that have sentimental value. It made me want to tell my own stories. A lovely and moving tale about Denmark during WWII. The people of that country worked tirelessly to save their Jewish friends and neighbors. This is my 2nd Lowry novel in the very recent past. I don't think you can go wrong when you read something of hers. Graphic novels are the best for read-a-thons. These two feature heartbreaking stories and incredible illustrations. I'm definitely going to read more by Yang...and I can't wait. Oh, these kids! Their circumstances and poor decisions will make you want to tear your hair out. This one was thouroughly impressive. Once in a while I'll read a book that makes me angry. Angry that I've gone my whole life without reading it. This was a complete delight! Quirky and quite brilliant. I want to read the rest of the series! Successful day, super great books. I feel like a very lucky reader! Did you participate in the Read-a-Thon? What were some of your favorite books that day? *My favorite of the day! I have never even considered reading Mary Poppins. I might have to correct that. Congrats on a great readathon. The Secret Life of Objects sounds great! I've somehow never read either of Lowry's novels - I think I started The Giver but couldn't get into it for some reason. I've heard such good things though, so I'd love to give her writing another go! I recently read The Giver because my daughter is reading it for English. I thought it was crazy that I hadn't read it yet ;) Maybe she's just not your bag Lucy! I have got to get my hands on Boxers and Saints. I love Yang!! Those are the only 2 of his that I've read but I'm definitely going to be getting my hands on more! I love black humor. I'm going to check out The Suicide Shop. Looks like some good reading. I love a book that makes me want to tell my own stories, like The Secret Life of Objects did for you. I didn't get to do Deweys this time. its hard for me to do events on weekends. I really want to read Lois Lowry books and I will have to give Mary Poppins a try. It can be hard to carve out that much time, especially when you have kids. I hope you'll be able to participate next time :D Mary Poppins is the best! Who doesn't love Mary Poppins? It's been ages since I read that one. 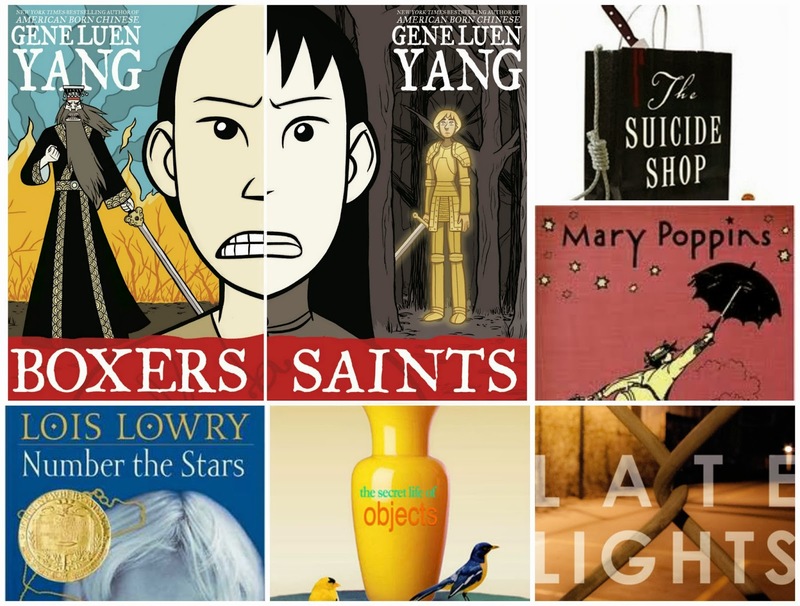 Gene Luen Yang's American Born Chinese is excellen, too... I bet you'd love it! I'm definitely going to get my hands on American Born Chinese! Oh Mary Poppins! When I was little I found a copy of the book at my grandma's and now have it in my possession. Love it!! Number the Stars is one of my first books I really remember reading. So good. I always find that I get sucked into cheering and forget to read! Setting a timer helps me keep on track (seriously). I'm hoping I can play along in April. I've missed the readathon!!! A timer is a good idea! Seriously, I should really do that. Time just flies! I hope you'll be able to do it again in April too :) It's the MOST fun! Mary Poppins is so good, in a really dark way! Lois Lowry was one of my favorite writers when I was a teen. She writes great stories. I didn't know what to expect. I thought it was so funny...and Mary was a grumpy thing, lol. Vain too! Lucky you that you had such great picks for your readathon and got so much done! I'm totally into reading Boxers & Saints! I cannot wait to read Boxers and Saints. I started reading Boxers at B&N the other day and thought it was really good! Oh yes, you definitely want to get your hands on them :D So good! I am so bummed that I missed Dewey's! I've been cheering and reading the past couple of times and I still haven't figured out a good way to make it work. I stay awake longer if I do my cheering later but then there's hardly anyone still awake to appreciate it! I think it would be a heck of a lot easier to cheer for people on Twitter. Does that make sense? I hope you can play along in April! I only finished 2.5 books but I'm going to do a mini review post for my 2 books too...great minds and all that!! you had a great event! Good job on this post too. Great minds indeed, lol. I always make sure to read little books, then I feel like I'm really accomplishing something. Also, I really don't know how I'd do reading one book ALL day long. I think I might get burned out? I *almost* didn't click on this post just because I knew it would make me sad that I didn't get to participate. In the spirit of being supportive, however, I put aside my own shame and came to say congrats on such an amazing day! You never cease to amaze me with your reading…. I'm so glad Poppins got the thumbs up! It's one of my favorite movies, and while I know the books will be different I expect the magic and whimsy will be there in spades. It was so adorable! Snarky and cute and yay! I really do want to read the rest of the series! Oh my gosh, I've never even thought of reading Mary Poppins. It's like the book version doesn't even register. I'll have to remedy that! I'm reading Boxers right now! Fantastic book! Did you know that Boxers and Saints was just nominated for the National Book Award? I need to read it soon. Number the Stars is a book I loved so much as a kid. I heard! I hope it wins..because it's the only one on the children's list that I've read, lol. I might have to make at least one of my kids read Number the Stars. I bought it for my youngest a few years ago and she's never gotten around to it. I need to fix that! Sadly, I missed the readathon this time around...I had out-of-town company and was sight-seeing all day. It's one of my absolute favorite days of the year, though, so spring!! I love cheering too. It's so fun to take a break and see what everyone's doing. Ah, you had a good reason to miss it. But I hope you can play next time! Someday I am going to do a Dewey. I just think I would end up sleeping most of the time way if I dedicated myself to reading for any length of time. I am a sleepy, sleepy girl. I keep waiting to catch up on my sleep so that I can do fun things like this. I have only read about half o Number the Stars because I was introduced to it when I subbed for the English teacher one day. I kept hoping I could schedule to cover her again rather than go get the book from the library but she upped and retired on me this year. So Mary Poppins was awesome. I gotta get it. Sounds lovely. LOL, you might have to make a trip to the library to get that book! It's worth the trip, I promise! Sounds like you did great with the read-a-thon! I missed it this time around. Mary Poppins by P.L. Travers looks great. I didn't know that was a book! Ha ha, that does sound crazy now that I think about it! I got two done, but I read biggies! So glad you had such a successful read-a-thon! I'm impressed you reviewed all of the books, even if they are quickie reviews! I'm impressed -- you read all those in 24 hours? I thought I was fast! Mary Poppins was such a great read, I'm super glad I finally got around to reading one! LOVE that tattoo idea! You should absolutely read the book/s Erin, you'd love it. LOL, I could totally be a hoarder too, for the same reason! I've only ever been a reader but it must be hard not to want to read and cheerlead when you want to do both anyway. maybe you could split your day in half? Short books or not that's a lot of reading. Looking forward to seeing what your final year count will be! I always want to do TOO MANY THINGS at once, lol. Hey, I like the idea of splitting the day in half!! I need to read Mary Poppins! It sounds like you had a lot of fun :) I read three longish books but I think I might try your strategy next time. It's just so satisfying to finish a book that I think it would be easier to keep going it I finished books more frequently. It works for me :) I don't think I'd do well if I had to concentrate on one book for too long. I didn't even know that Mary Poppins was a book, I need it!